In the morning drive to Haridwar from Delhi via Meerut and Roorkee. Upon arrival, check into the hotel. Later, in the evening visit the pious Har Ki Pauri for Aarti Darshan. Thereafter unwind yourself through a comfortable overnight stay in the hotel. Post breakfast, drive to Barkot via Dehradun and Mussoorie. En-route, enjoy lunch in Mussoorie and then continue the journey. You will reach Barkot by evening, upon arrival check into a luxury Swiss tent for an overnight stay. DAY 03 : BARKOT – YAMUNOTRI – BARKOT 42 KMS DRIVE / 6 KMS TREK. In the morning after an early breakfast, head off for a 42 kms drive towards Janki Chatti. 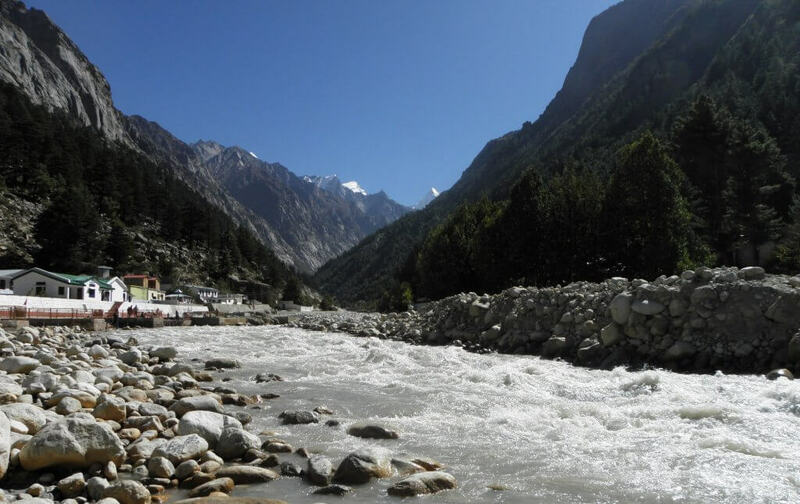 Upon arrival, begin your 6 kms trek towards Yamunotri. Once reached, visit the main Yamunotri temple for darshan; fold your hands and bow your head down before the Goddess Yamuna, and take her blessings for the pilgrimage. After paying homage, trek back to Janki Chatti in evening. From here our driver will take you back to Barkot, there you will enjoy an overnight stay in the camp. Begin the morning with an 82 kms long drive to Uttarakashi. In the journey visit the Prakateshwar Cave, a natural limestone cave that is famous for having formations resembling the holy Shivling. Upon arrival at Uttarakashi, check into a hotel. In the evening visit the Vishwanath Temple and later return back to the hotel for an overnight stay. Uttarakashi : It is situated at the bank of the Bhagirathi River and is bestowed with various.famous shrines. To name a few- Vishwanath, Ekadash Rudra, Bhairav, Gyaneshwar and Kuteti Devi Temple. Drive to Gangotri early in the morning. Once reached, take a holy dip in the pious water of the holy river Ganges, (also known as Bhagirathi). Perform the respective rituals and bask in the splendid and serene surroundings of the place. In the afternoon drive back to Uttarakashi and check into the hotel on arrival. After an early breakfast, drive to Guptkashi. A late lunch is scheduled en-route at Molgarh/Tilwara/Ghansali. In the way, see the heritage city of Tehri slowly sinking into the mighty waters of the Holy River Ganges due to the construction of the Tehri Dam. Take a lunch break and then continue your journey with the wonderful view of the beautiful river Mandakini. You will reach Guptkashi by evening. Upon arrival check in to a hotel and have a relaxing overnight stay. In the morning drive to Gaurikund (32 kms from one side). Upon arrival, you will have to walk through a zigzag route. En-route the lunch is scheduled at Rambara. Post lunch continue trekking towards the Kedarnath Temple. On arrival, check into a hotel or tourist bungalow. Freshen up and visit the Kedarnath Temple. Pay homage at the holy shrine and then in the evening visit the Adi Shankaracharya Samadhi, located just behind the temple. Return back to the hotel for an overnight stay. Trek down to Gaurikund in the morning, and on arrival drive towards Pipalkoti. By evening you will check into a hotel at Pipalkoti. Relax and enjoy an overnight stay in the hotel. In the morning, post breakfast, drive to Shri Badrinath Ji. There are various temples that will fall in the way, like the Narsingh Temple and Adi Shankaracharya Samadhi. Visit these shrines for attaining peace of mind and then continue the drive to Badrinath. Upon arrival, check into a hotel. Later, take a holy dip in the Tapt Kund, followed by a visit to the main temple. In the late afternoon, visit the Mana Village, the last village before the Tibetan border, Bheem Pul, Byas Cave & Ganesha Cave. Drive back to Badrinath and in the evening you can visit the shrine for Aarti Darshan. Later, enjoy an overnight stay in the hotel. If you want to see the Holy bath of the Sri Badrinath then wake up early in the morning by 03:30 am and enjoy the beautiful sight. After breakfast drive to Rudraprayag via Joshimath, Chamoli, Nanda Prayag and Karna Prayag. On arrival, check in to a hotel and have a comfortable overnight stay. In the morning drive to Rishikesh via Srinagar and Devprayag. Devprayag is the confluence of holy rivers Alaknanda and Bhagirathi; after meeting at this place, these two holy water bodies unite together to form the Ganges. Once arrived at Rishikesh, check into a hotel. Later visit the Laxman Jhula, followed by an overnight stay in the hotel. In the morning after breakfast, drive back to Delhi. Arrive at Delhi by late afternoon. Tour and Services Ends.